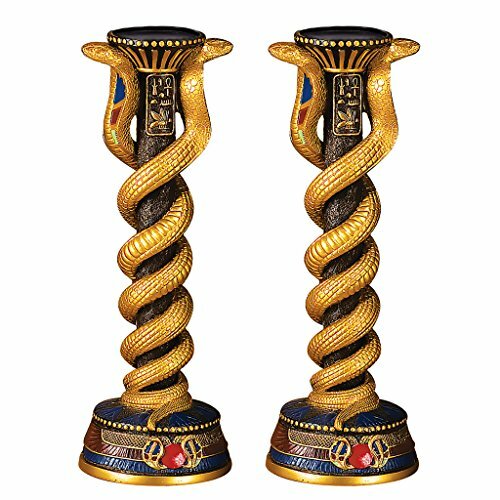 With a touch of pure drama, the inventive artist entwined twin cobras to meet at the crown of this breathtakingly dramatic, over foot-tall altar candlestick. Cast in quality designer resin and painstakingly hand-painted in tones of ebony and gold, this Egyptian Revival work of decorative art includes a black pillar candle stenciled with gold hieroglyphics. Beautiful alone, it is quite stunning paired on mantel, entry table or in a gallery. 4"dia.x11"H.